App developers, I think it's time we put a moratorium on the titling of games with "(Adjective) (Animal)", don't you think? 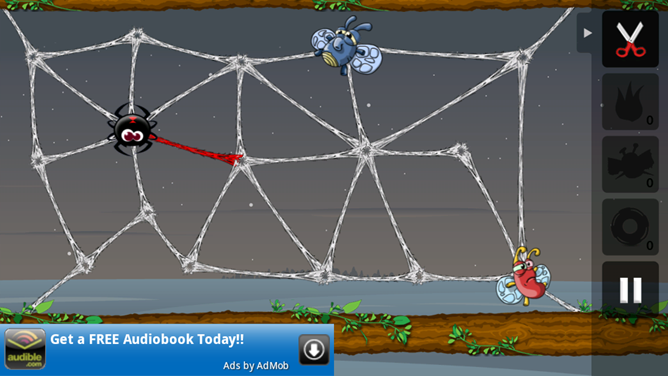 It's getting a bit tired, and trying to emulate Angry Birds doesn't really do you any favors. 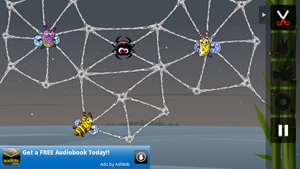 Greedy Spiders is a turn-based puzzle game in which you are looking to save flies from their grisly demise at the hands of the aforementioned Greedy Spiders. I believe the fact that the spiders are greedy has to be highlighted, because otherwise you are just preventing them from eating. You free the insects by chopping off spokes of a spider web one at a time; the spider will then take its turn and move down a strand, shifting play back to you. Your goal is to either cut all the spokes that hold the bugs, or make it impossible for the spider to reach them. 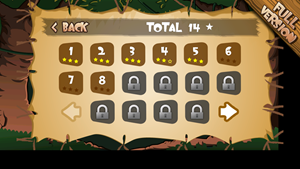 Satisfying either condition will free the prisoners, and tabulate your score. 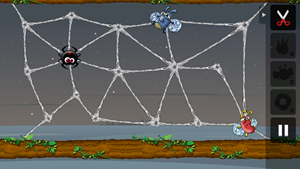 Like many other games of its kind, Greedy Spiders uses the "here's a bunch of levels, get three stars in all of them" mechanic. 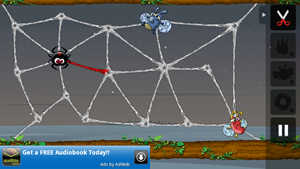 While it's becoming annoying to see it it in nearly every game (regardless of whether it needs it or not), Greedy Spiders gets a pass because it's score-based, instead of being dependent on collecting some arbitrary item. Stars are used to unlock more levels, which isn't a big surprise. 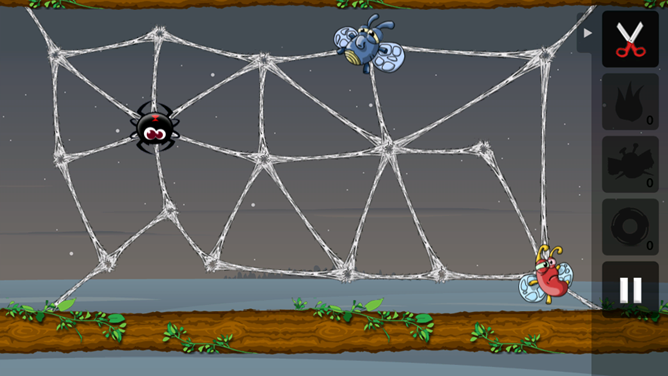 Levels start out easy, but quickly get difficult with the inclusion of more spiders and flies to save. This isn't exactly creative level-making, but it allows for new content to be created and distributed quickly. The game plays like a mixture of chess and tic-tac-toe, as the turn-based nature makes it very strategic. It's almost as if the developers just wanted you to slow down and think about the move you're about to make, as in later levels it's quite easy to snip yourself into a corner. While the aesthetic of the game evokes a very "Burn The Rope" image in my mind, there isn't much in common. The closest thing is a fiery power-up, which chars a good amount of lines. Other powers include decoy spiders and the ability to automatically save one fly on the board, no questions asked. There are some things I have problems with in this game, such as the poor resolution choices of the title, menu and splash screens. They don't take up the whole screen of my Atrix, and just make things look really unpolished. While it might be a bit much to expect every single image file to fit every screen, a variety of resolutions to fit different models would be nice. Lack of polish aside, I do like that Greedy Spiders seems to be a shift away from the fast-paced, physics-laden puzzles that seem to be taking smartphones by storm. Once and a while I like to slow down and actually think, instead of having to worry about whether my phone is tilted the right way to get object X into hole Y. 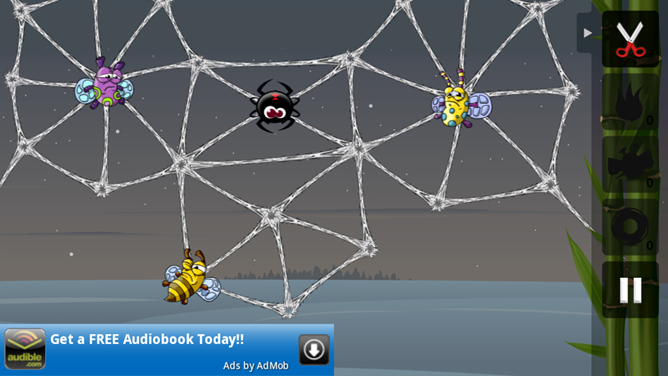 Puzzles should force you to scratch your head a bit, and Greedy Spiders does that nicely. 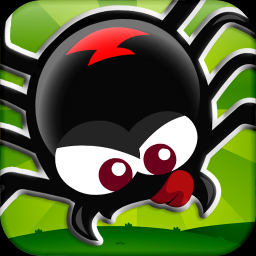 Greedy Spiders is a $0.99 download on the Android Market, but also comes as a free Lite version if you'd prefer to try it out first. It isn't the top Android puzzler by any margin, but for such a cheap price it's a good buy if you like to think four or five steps ahead of an AI.